Last month I was searching for a light to medium coverage foundation that can be worn everyday. I don’t usually wear foundation everyday but when I decide to its the MAC Pro LongWear. Lately I’m finding it too heavy and the effort it takes to properly blend this foundation out is too much work for a busy woman on the go,go,go,….you get the idea! 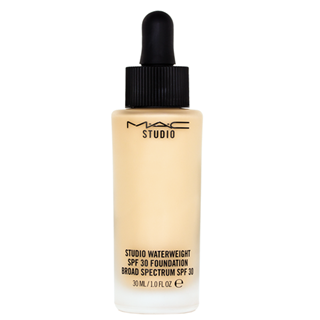 I popped into a MAC store one afternoon and the MAC girl raved about the Studio Waterweight foundation.I had never heard of it before so I was curious to try it out and see for myself what the hype was about.I purchased it in the shades NC40 and NC42, just in case.I’ve been wearing it for 3 weeks (almost) everyday now and I’ve fallen in love with this foundation. The foundation is encapsulated in a glass bottle with a dropper to easily dispense the right amount of product right onto my Sigma flat kabuki brush. Genius! It has an ultra-fluid, thin, serum-like consistency. Upon application it felt very silky on my face, not cakey at all. I noticed right away that it blurred out my “freckles” ( OK sunspots) on my temple. This impressed me as I was really considering getting these spots lasered off! The finish is neither matte nor dewy. After one application it has a very natural finish, almost satin/sheen like. At two applications it’s a full medium coverage foundation. I’ve only been applying one even coat and I’m really happy with the amount of coverage I’m getting. As I’ve mentioned before, I have very dry skin in the winter and I felt this foundation didn’t dry up my skin.I can’t say it hydrated it either, but it does a good job of not drying it up further.I love the idea that the watertight foundation has SPF 30 in the formula. As well the MAC girl gushed over the fact that it’s full of antioxidants(to help repair damaged skin). This can be used on all skin types including acne prone skin. It’s water based and should not cause irritation to the skin.